Teaching grade-level content to students who have just arrived in the United States and whose English skills are limited is a difficult task. High school-level content specialists especially have little training on how to integrate language acquisition into their content. Often teachers deal with that by either dumbing down the curriculum to make it linguistically simpler or alternating between lessons focused on language and those about content. Teachers in San Francisco were looking for better ways to teach their newcomer students the English skills they need, without losing a focus on the complex content all students should be learning. To do that, they looked to adopt some of the strategies of the Writing Is Thinking Through Inquiry (WITsi) work being done in New York City with the general education population. Based on Judith Hochman's work, at its core these strategies focus on building up students' ability to put together sentences piece by piece*. Through an inquiry process, New York teachers discovered that their students’ writing was breaking down at the level of the sentence, making it difficult for them to express more nuanced and complex arguments. Nell Scharff Panero developed the WITsi strategies and has been working with New York Renewal schools to implement them. As she watched teachers having some success, she realized the same strategies could be powerful for English learners. She has been working with language specialists to adapt the strategies for that population. 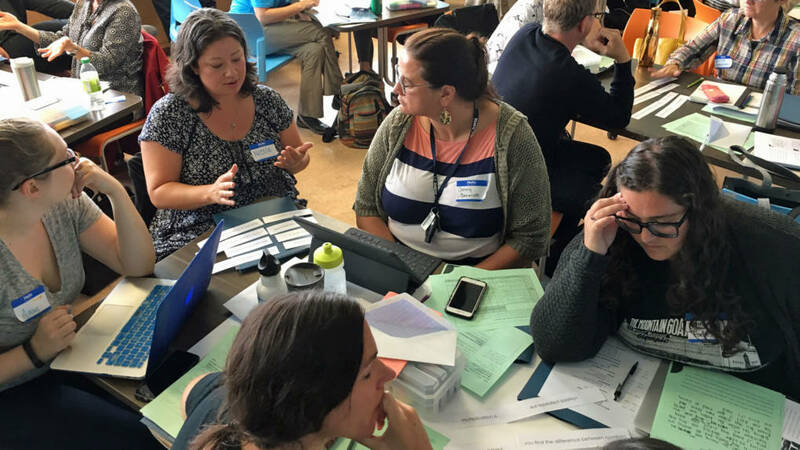 San Francisco Unified School District is starting small, bringing together sheltered pathway teacher cohorts from seven high schools around the district. Together they look closely at student writing, share lesson ideas, and try to deepen their own understanding of the English Language and how to teach it through content. “Given these strategies that support language, that support writing, without having to sacrifice the focus on content has felt liberating to people,” Gottesfeld said. The program is intentionally set up around cohorts at each school so that teachers can collaboratively build the WITsi strategies into every class, regardless of content area. One activity asks students to write sentences using “but, because and so” correctly. These small conjunctions are powerful language markers that students often use incorrectly. But when the science teacher is using “but, because, so” sentence routines to help students understand relationships in an ecosystem, while in the next room the history teacher is using the same structures to help students identify the effects of colonialism, it reinforces writing and thinking for students. And, it means students are getting explicit language development help throughout the school day, not only during their legally required English Language Development time. “I was like, oh, this is what I’ve been missing,” said Anne Ryan, a history teacher in the sheltered language pathway for newcomers at Thurgood Marshall High School in San Francisco. She first learned about some of the strategies through an exchange with the Internationals Network for Public Schools in New York, whose teachers have become standouts in developing language alongside content. She was trying to use some tips she picked up at a conference on her own when SFUSD announced the current pilot. She jumped at the chance for more formal training on the strategies. Bringing instruction down to the level of the sentence forces the teacher to carefully identify the most important information she wants her students to learn that day, and build sentence-level activities around the main content goal. This practice often leads to more effective instruction, in addition to helping students build their language skills. WITsi work in New York City Renewal schools with the general education population has uncovered similar sentence-level misunderstandings in high school student writing. In those cases, it’s often hard for high school teachers to accept that they have to go back and teach the basic building blocks of good sentence writing, then paragraphs, and finally essays. They feel that their students should already have those skills. But with newcomer students, teachers are hungry for anything that will help them make their curriculum more accessible to students who don’t have language skills yet, but desperately need them. All of these strategies should be used in conjunction with the most important content of the day. The idea is to marry the linguistics with subject matter content at every step to make the language relevant, while helping students learn the content. 1. Sentence boundaries: These activities are designed to help students understand what a sentence is and what it is not. In the process, teachers can identify the parts of a sentence: noun, verb, object, but more than the grammar, these activities use content to discuss what makes a sentence. How can one tell if something is a fragment, or a run-on? Activities include matching different parts of a sentence to either make a complete sentence or repair a fragment. Or, teachers might ask students to sort sentences into fragments, complete sentences and run-ons. “But again all the sorting that you’re doing is around the content that you’re studying,” Gottesfeld said. So, if the lesson focus is Alexander Hamilton, all the sorting and matching is related to his historical contributions. The dual approach is the most important part of all these strategies. 2. Recognizing different sentence types like statements, questions, exclamations or commands. This includes helping students look for clues -- does the sentence start with a question word, for example? While it may seem simple to a native speaker, expressing the content using various types of sentences can dramatically change meaning, an important concept for students to understand. Also, focusing explicitly on questioning helps empower English learners as question askers throughout the curriculum and in other learning settings. 3. Working with the coordinating conjunctions “but, because and so” to help students elaborate on their sentences. Many students, even ones who speak English, don’t have a firm grip on the differences these words signal. “But, because, so” activities might start off with matching sentence stems to sentence ends based on the conjunction, and gradually become more difficult, ending with giving a student the three bases and having them complete the sentence. This is often a favorite with teachers and students because it begins to open the door to more analytical thinking. Knowing how to use these conjunctions is not only a language rule, it indicates the student’s ability to think comparatively, to explain, to make connections. Subordinating conjunctions are an important way English speakers vary sentences structure and express complicated relationships between things. They’re also tricky for non-native English speakers, and deserve explicit introduction. Words that signal time and position are powerful expressions of analytical thinking. When teachers introduce subordinating conjunctions within a content lesson, it gives students more ways to express complex ideas and improves sentence fluency. Activities in this sequence include giving students two sentences and asking them to use a variety of techniques to combine them into one. Scaffolds might include giving students a word bank or conjunctions to choose from, while the most complex version might ask students to write a sentence with an independent and dependent clause on Alexander Hamilton that uses a conjunction. A core goal of these activities is to use relevant content to help students reduce redundancy in their writing by combining sentences. It’s also an opportunity to work on syntax within the context of content objectives. Students are motivated by the desire to be understood. Appositives are a language structure that allows the writer to rename a noun. This is another explicit language structure that makes student writing more interesting, specific and nuanced. But rather than making it a disconnected grammar lesson, teachers can use activities about their content that incorporate appositive practice. Many English learners also struggle to follow the chain of references in texts with unknown words, so explicitly teaching about appositives can help with reading comprehension as well. In these activities students ask students to expand on a simple, unelaborated sentence by asking them to answer a series of questions aimed at teasing out details. A typical simple sentence might be, “Alexander Hamilton helped establish it.” The teacher then writes questions to identify the information that would elaborate this sentence: What did he establish? Why did he establish it? How did he do it? Who helped him? Once students have identified all these details, they rewrite or “expand” the unelaborated sentence into a much improved one that includes those details. This guided process helps model the way English sentences are constructed and is a precursor to revision. “The ‘Writing as thinking’ presents somewhat of a sequence to introducing these strategies and approaches,” Gottesfeld said. “That feels new and clearly makes sense” to many teachers in the sheltered language pathways. And when students have these clear sentence-level building blocks, practice them regularly, and understand the way they function to express ideas, teachers can use them in the most complex process of all: parallel revision. 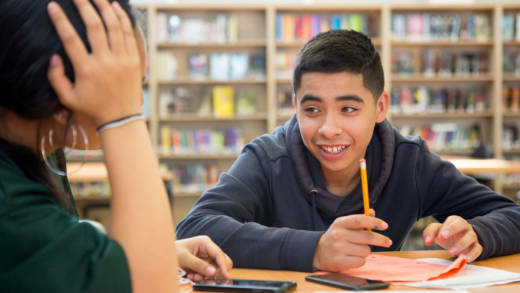 “We know that revision is critical for the writing process to support students in developing good writing,” Gottesfeld said. Parallel revision is a more structured way to help students revise their writing. Teachers might write “elaborate” next to a thought in a student’s paragraph and suggest the student think about the “but, because, so” strategy to carry out that elaboration. This practice can also make peer revision more useful, grounding the discussion in specific strategies the kids know well through prior practice. “It puts the kid in a position where they have to think about language that they know and try to apply it,” said Joanna Yip, a former teacher in the Internationals Network who helped design the materials and activities SFUSD teachers are using. “It is an absolutely necessary component for kids who are learning the language.” Through parallel revision students begin to truly appropriate the language and transfer the piecemeal sentence-level work into paragraphs and even essays. Yip said this systematic approach to language construction that WITsi offers is fairly new to many English language teachers, especially ones who see themselves foremost as content specialists and secondarily as teachers of English. Rather than chunking out the steps of writing a paragraph and asking students to follow instructions, parallel revision requires students themselves to do the thinking about which strategy responds to the teacher’s feedback. And keeping these strategies tightly tied to the content makes the language lessons useful to students. Too often when teachers try to focus on the nuts and bolts of language, they end up delivering a disconnected lesson on grammar that students don’t transfer to the writing they do in each content area. “If they have opportunities to do this kind of work that is appropriate for their phase of language development, then over time they will gain that momentum as students,” Yip said. “When they feel supported in doing it, it’s a rigorous task, but a task they can manage.” She said it’s unreasonable to ask a student who has been in the country for three months to write an essay. And without carefully scaffolding writing strategies, that student may never get to the essay writing level. Evelyn Sulem is just finishing up her second year of teaching high school history. She said teaching in the sheltered language pathway isn’t a highly coveted position, so it often falls to newer teachers. But she enjoys watching the incredible progress her students make and plans to continue teaching newcomer students, especially now that she feels she has a few more tools and a supportive group of colleagues. “I have definitely seen a massive progress in the level of English and in the level of content knowledge,” Sulem said about using the WITsi strategies. She meets with colleagues from other content specialties who also teach newcomers once a week. They share strategies and try to sync up their curriculum to reinforce vocabulary, concepts and language structures. “We try to bring forth the vocabulary in all the disciplines,” Sulem said. Through this intensive WITsi work, she has also become more aware of the different English levels in her classroom. She is now carefully building more scaffolds into her lessons, using WITsi strategy variants to support her students to understand the history content. For example, students might complete the activities in their home language, or discuss the content with a partner in their home language before trying to use their English to write down thoughts..
“We teach history in a workshop style,” Sulem said. The social studies department at Lincoln wants to build students into critical thinkers who can analyze history. They try not to lecture from the front of the room, and have de=emphasized memorization. That’s even more important when students don’t understand the lecture anyway. “We don’t give any lectures, but we engage students with simple text which has history content,” Sulem said. Sulem is grateful the WITsi work has given her more tools to reach her newcomer English learners, but she admits the work is very difficult. Many of her students arrived in the U.S. with interrupted educations, and their writing skills in a home language aren’t strong either. And because she teaches a few sections of general education students, Sulem is applying tactics that work with her newcomers to all her classes. She thinks teaching English learners has made her a more creative teacher, helping her to guide kids to an analytical understanding of history using multimodal forms of learning. And when she can see a student is struggling to express a complex idea in their writing, she’s got more linguistic supports to help them get there. *This piece has been edited to reflect that the WITsi strategies build on ideas originally developed by Judith Hochman.